Hard ’N Phirm are a comedic musical duo (Chris Hardwick and Mike Phirman), who did not make much of an impression with their track on the Comedy Death Ray compilation CD (reviewed 9/11/07). Now Comedy Central has given them their own full album, “Horses and Grasses,” which is actually a re-release of a CD previously distributed on a small independent label. However, the network seems to be hedging its bets, distributing the album only online, starting December 18, and not on pressed CDs. “American Dinosaurs,” done up in the style of Lee Greenwood, or perhaps Toby Keith, is based around the joke that dinosaurs were patriotic because they gave their lives to become oil after eons in the ground, so Americans can enjoy their cars and SUVs. It may be the only track worth owning out of the whole album. Perhaps one or two others come close -- “She Named the Pony Jesus” seems to have something to do with a girl getting her first period with allusions to “riding the red pony” and tying that together somehow with being pro-life, although the whole parody is a bit muddled, obviously. But largely, Hard ’N Phirm don’t execute their jokes as well as Stephen Lynch, not by a longshot. The latter half of the album especially falls off in quality. “Anything,” another track cloaked in Christian devotional music style, attempts a Sarah Silverman-type joke, ending its message of “you can do anything,” with the surprise “unless you’re a girl.” Except it’s taken three whole minutes to get to this joke, and Silverman understands good timing means you shouldn’t be taking that long. Futher, “El Corazon,” sung entirely in Spanish, makes it hard to tell if Hard ’N Phirm are actually being earnest or intend the song as some sort of joke. Without a translation, it’s hard to know. 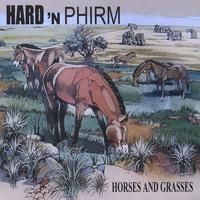 Overall, there really isn’t much on Hard ’N Phirm’s full length album to merit repeat listens. Try a little harder next time, boys.